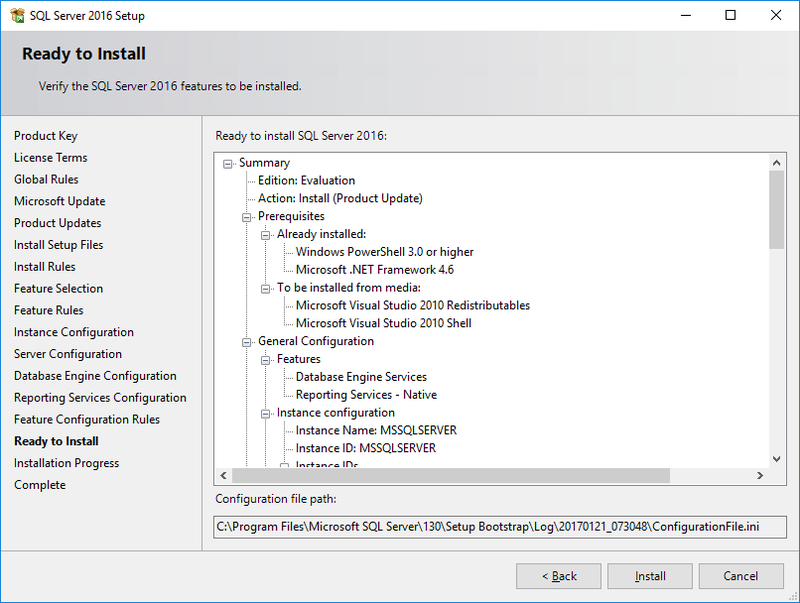 In our previous post, we have seen how to perform and simple and standard installation of SQL 2016 Server instance. The previous post was describing a manual installation which is just fine for a single instance installation. However, when you have more instances to be installed, it might make sense to try to automate the installation process. 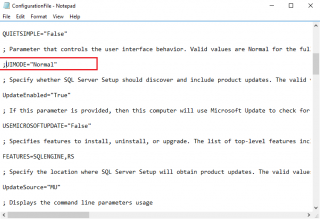 Luckily, SQL Server Setup provides ways that can be used to automate the installation process. This post will focus on the configuration file approach. 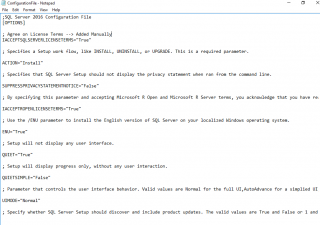 During the setup of SQL instance through the GUI, a configuration file is generated automatically that holds the different parameters that have been used during the manual installation process. 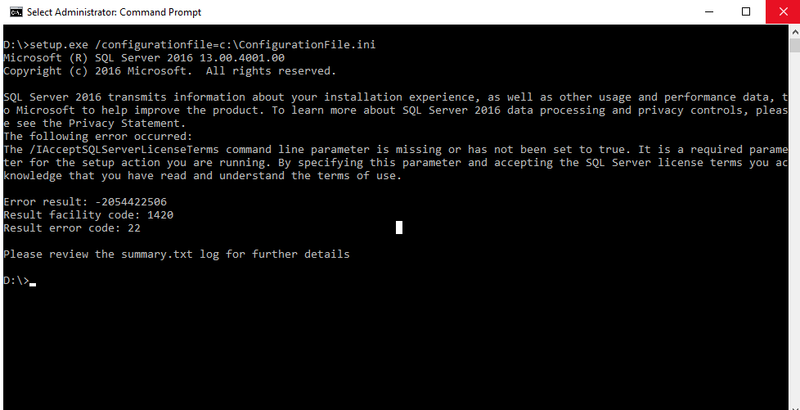 In the ready page of SQL Setup wizard, you can see at the bottom of the screen that a configuration ini file has been generated and can be used to perform unattended installation. 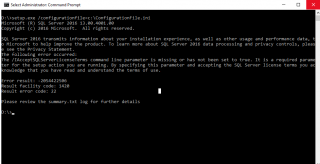 By default, after a manual installation , you can find the configuration file under <%ProgramFiles%>\Microsoft SQL Server\130\Setup Bootstrap\Log\xxxx\ConfigurationFile.ini. However, the configuration file generated during the manual setup is not useable as such without some modifications. If you try to run the command above with an untouched configuration file, you will end up with the following error. In the next section, we will see which modifications are needed in order to have a successful unattended installation process…. We have put in bold the most important parameters that we need to look at. Because this is my own configuration file, you can see in the configuration file the service account that I have been using during the manual setup. So, hereafter, you can find a copy of the configuration file that has been configured when we have performed the manual installation process (see part I of this post). ; Specifies which account the report server NT service should execute under. When omitted or when the value is empty string, the default built-in account for the current operating system. These changes are needed in order to have an unattended installation process but they might be a need to update some more settings in your file based in the configuration ini file that has been generated. We know need to tackle the service accounts aspect…. Based on how the configuration ini file has been generated (i.e. based on how you have performed the manual installation), you might still need to modify the configuration ini file. During our manual setup installation of SQL, we have used domain accounts instead of local service accounts. These domain accounts are referenced in the configuration file. However, for security reasons, no passwords have been recorded and saved in the configuration ini file. If you are planning to use domain accounts, you will need to update the configuration ini file in order to reflect the correct user accounts to be used as shown in the extract below. 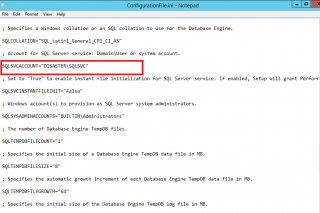 ;Account for SQL Server service: Domain\User or system account. SQLSVCACCOUNT=”YourDomain\sqlsvc” SQLSVCPASSWORD=”Password”  ;Specifies which account the report server NT service should execute under. If you do not want to store the passwords in the configuration ini file, another option would be to pass the credentials in the command line as additional parameters. 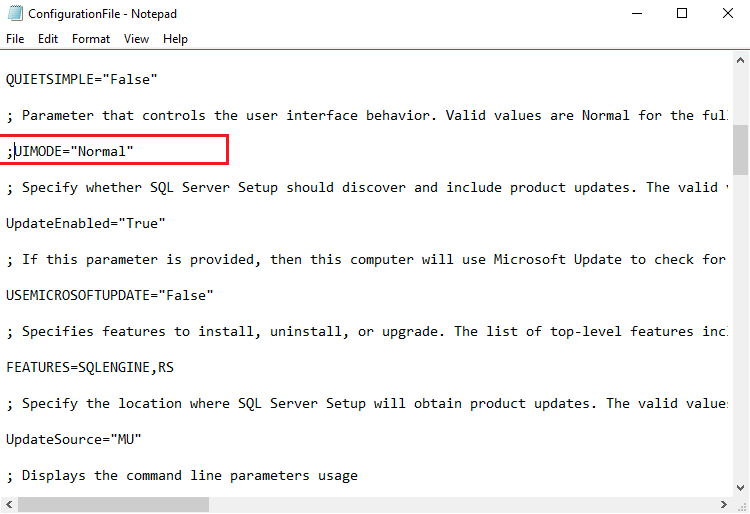 The following command could be used to automate the installation of SQL while not storing password in the configuration ini file and passing them through the command line. $pwdSQLSvc = Read-Host -assecurestring "Please enter your password for SQL Service"
When executing these commands in a PowerShell console, you will be prompted for the password and the unattended installation will start automatically. Nobody would see the passwords that you would have been using…. 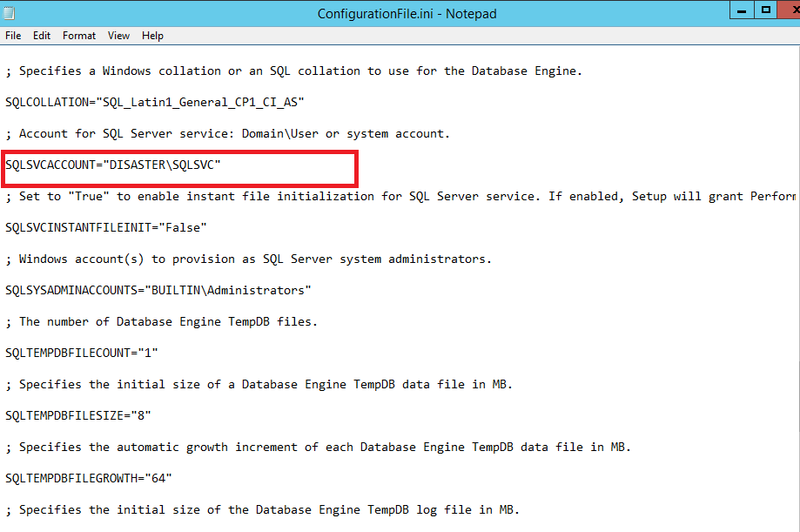 ;Agent account name  AGTSVCACCOUNT="NT Service\SQLSERVERAGENT"
;Specifies which account the report server NT service should execute under. 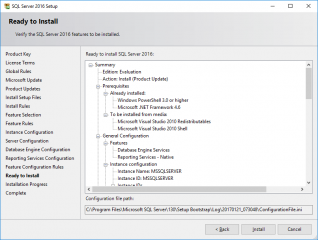 At the end of the installation process, you will need to perform a post setup action which consist of changing service accounts information for SQL service. This can be performed manually or through a nice PowerShell script from a central server…. I never had to perform an unattended installation of SQL so far. Things are changing and we need to deploy a large number of SQL in certain projects. 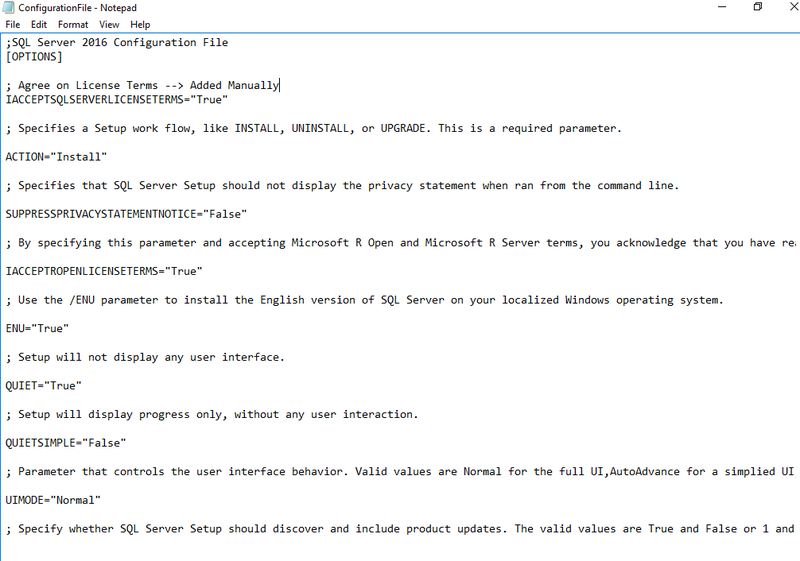 Luckily, SQL setup provides an easy way to automate installation. The only challenge resides in the service accounts to be used. As we are using MDT to deploy some environments, the safest approach (security wise) is to use local service accounts to be sure that no passwords are advertised by mistake. For other scenarios/situations, the combination of the configuration ini file and the setup.exe command line seems to work quite well which can even be improved by using PowerShell scripting capabilities…. This is it for this post…. In the next part, we will check the command line option only.. I assume it´s easier to deploy with MSA acct for service accounts (no password).